Vodka has long been known as the 'taste-less' and most bland of spirits. 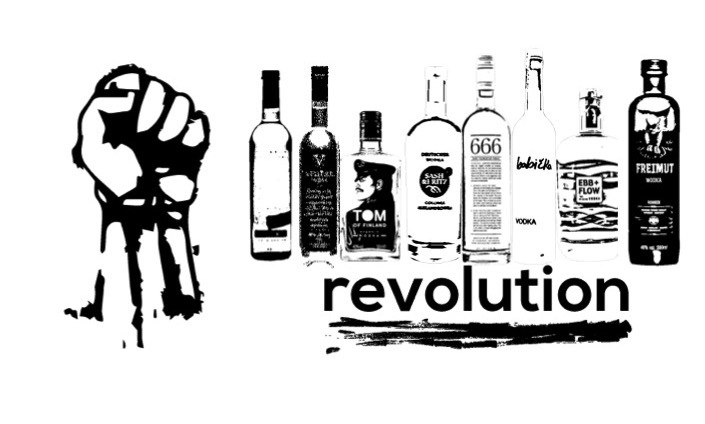 In the past few years vodka has begun to mount a revolution which is beginning to gather pace. We're at the beginning of a huge movement in vodka, producers are beginning to focus on styles, grain, production and ultimately taste when it comes to their end-product. It’s changing the way we look-at and consume vodka. Taking the word ‘Handmade’ way too seriously. Boyd & Blair produce potato vodka in Pennsylvania in their 1,200 liter copper pot still, they focus on flavour and creating the perfect sipping vodka. Most of the vodka world will agree with us when we say, brand owner William Borrell is the Che Guevara of the vodka revolution. Vestal has been flying the flag for ‘terrior’ in vodka; Vestal Vodka is rapidly becoming a household name. Embodying the spirit of revolution the team behind the brand picked the iconic Touko Valio Laaksonen for their rye and wheat vodka. Adapting to the emerging vodka market they produced a vodka with flavour and personality. We like your style Tom. It’s well known that the best meals are made from ‘simple ingredients done well’. Founder Peter Steger spent two years choosing the right water and wheat grain for his vodka brand to create the perfect flavour in his vodka. Flavour inspirations usually come from place and 666 Pure spent painstaking years developing the recipe for their vodka. Using Tasmanian Barley and Cape Grim rainwater, their flavour is unique and has a real sense of place. Babicka Vodka, has spent a number of years fighting their ‘flavoured vodka’ distilled with wormwood rather than ‘adding’ any flavour it’s a traditional Czech vodka distillation technique. We’re predicting big things for this long-fighting independent. A single malt vodka made from 100% Palouse Malted Barley. The Seattle based distillery focus on a ‘grain to glass’ production technique and consider themselves ‘real craft’, we’re inclinded to agree Sound Spirits. Completely unfiltered is a word you rarely hear when it comes to vodka. FREIMUT Vodka have been blazing the trial of vodka with flavour, the Champagne rye grain gives FREIMUT a taste five years ago you would have never have associated with vodka. We’re delighted those tastes have changed.